This stock market cycle is old and towards the end of any cycle, easy money often leads to a misallocation of capital which can fuel a boom before an eventual bust. We have already seen this in Bitcoin which, having surged during 2017 from $1,000 to $20,000 per coin, now trades just under $7,000. Naturally we are on the alert for other such manias and the data aggregators such as Facebook and Google look a candidate. It is this group (which includes Google having rebranded to Alphabet) which comprises of Facebook, Alphabet, Amazon, Apple and Netflix (FAAAN). Many readers might have found themselves logging into Facebook to keep up to date, searching Google for a quick fix to a problem or tuning into Netflix to catch the latest episode of their preferred show – all on their latest Apple electronic device, of course. You may have even found yourself resorting to Amazon Prime for a show that is not available on Netflix; following the purchase of a few unnecessary items and opting in for next day delivery. It is unarguable that the FAAAN companies have innovated their respective industries and have been able to gain significant market share leading to super normal growth of revenues and ultimately value over the last decade. Therefore, it should not be surprising that their combined revenues (at the end of 2017) amounted to $570bn which is identical to the entire output (GDP) of Sweden! The stock market is a discounting mechanism and in an ‘efficient market’, the price you pay should incorporate all available public information regarding the journey the company has had as well as its prospects. However, the market does get it wrong and as Benjamin Graham observed “in the short run, the market is a voting machine but in the long run, it is a weighing machine”. 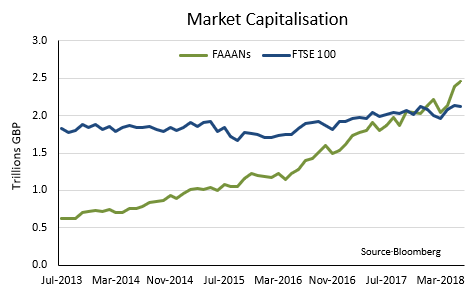 Based on all the information available today, investors have valued the FAAAN companies at a total market capitalization of ~£2.5 Trillion, roughly equal to the value of ALL the companies in the FTSE 100 combined. However, what does interest us is the amount of capital today being allocated or maybe even misallocated towards these companies with already high rates of perceived growth priced into their valuations. Investors are currently willing to place a higher value on the FAAAN’s than the 100 largest companies in the UK – represented by the FTSE 100. We will not bore you with the differences in business models that these 5 companies have with the FTSE 100 constituents, but we would highlight the current FAAAN valuations suggest that investors are certain that the high growth exhibited by these firms can continue, and for a long time yet. Investors have priced these FAAAN stocks highly and are willing to pay up for their expected high growth in a low growth, low interest rate and low inflation environment. The market has, at the time of writing, decided that the prospects of these 5 companies is far brighter than the prospects of all the companies in the FTSE 100. Whilst we believe that this valuation is excessive, the bigger question is what if it is not? Could the prospects for the UK’s 100 really be poorer than these 5 US companies and if they are, what does it say about the business models, governance and management of these FTSE 100 companies? Over the longer term we will get our answer, but in the shorter term we have voted and believe the FAAANS to be overvalued but, just as with Bitcoin in 2017, the market could yet propel them further. The value of your investments can fall and you may not get back the amount invested. Past performance is not a guide to future performance. Please see the relevant section of our website for more detailed information and risk warnings. You should not invest in or deal in any financial product unless you understand its nature and we recommend you seek advice.